Many children who receive a diagnosis of learning disabled are actually suffering from eye and vision-related problems that can be detected by an InfantSEE® exam. If not detected during infancy, poor eye coordination will cause future learning difficulties for your child. If the eyes do not work together effectively, your child will experience future difficulty reading for extended periods of time or poor reading comprehension. Poor eye teaming can also result in avoidance of detail work, such as writing or art projects. Or, your child may simply demonstrate awkward or clumsy movements that are actually vision problems that can be effectively addressed by your optometrist. If your baby did not receive an infant eye assessment, arrange for one as early as possible. It is very important to take this step and begin a lifetime of healthy vision. Vision development and eye health problems are easier to address if treatment begins early. Failure to detect and treat eye and vision conditions can impair your baby’s ability to reach important developmental milestones. More than a health issue, this can create lifelong learning and social problems for your child. After your Infant SEE® assessment, annual comprehensive eye exams for your child through age 18 are covered by the Pediatric Essential Health Benefit in the Affordable Care Act. 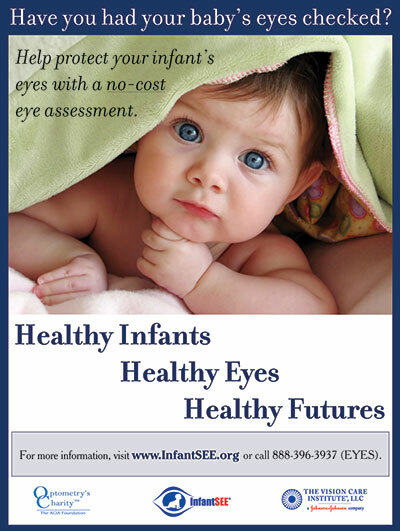 InfantSEE® is not just an assessment of your baby’s vision, but a vision of your baby’s future. Healthy eyes and vision are the key to your baby’s quality of life. To find an InfantSEE® optometrist in your area visit InfantSEE.org.